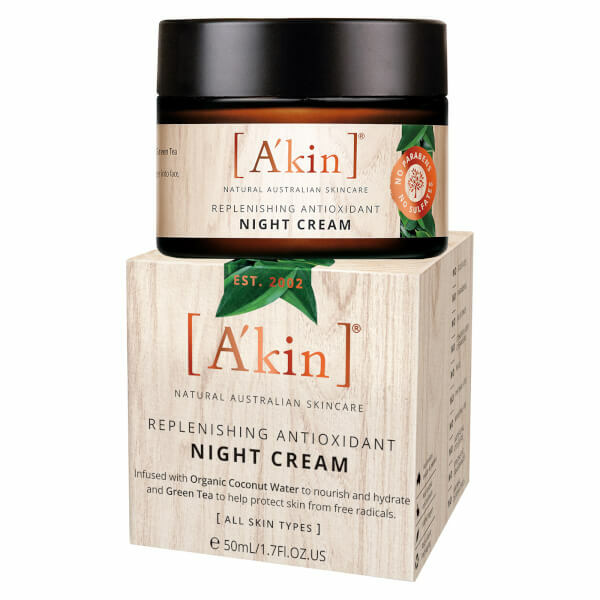 Rejuvenate skin whilst you sleep with the A'kin Replenishng Antioxidant Night Cream; a lightweight, non-greasy formula that absorbs quickly to nourish and protect around the clock. Infused with a cocktail of beneficial ingredients, including Organic Coconut Water, Green Tea and antioxidant Vitamin E, the overnight treatment delivers optimum levels of moisture and hydration, whilst defending against the damaging effects of pollution and environmental aggressors. Expect a soft, smooth and revitalised complexion come morning. Water (Aqua), Cocos Nucifera (Coconut) Water*, Butyrospermum Parkii (Shea) Butter*+, Cetearyl Olivate*, Aloe Barbadensis Leaf Juice*+, Cetearyl Alcohol*, Glycerin*, Crambe Abyssinica Seed Oil Phytosterol Esters*, Simmondsia Chinensis (Jojoba) Seed Oil*, Sorbitan Olivate*, Macadamia Ternifolia Seed Oil*, Sucrose Stearate*, Persea Gratissima (Avocado) Oil*, Niacinamide, Tocopheryl Acetate* (Vit.E), Palmitoyl Camellia Sinensis (Green Tea) Extract*, Cocos Nucifera (Coconut) Fruit Juice*, Behenyl Alcohol*, Sorbitan Caprylate*, Hydrogenated Olive Oil*, Olea Europaea (Olive) Fruit Oil*, Phytosterols*, Xanthan Gum*, Ethylhexylglycerin, Sodium Gluconate*#, Olea Europaea (Olive) Oil Unsaponifiables*, Palmitic Acid*, Rosmarinus Officinalis (Rosemary) Leaf Extract*, Helianthus Annuus (Sunflower) Seed Oil*, Tocopherol, Fragrance*, Lecithin*, Potassium Sorbate, Sodium Benzoate, Propanediol, Benzoic Acid, Limonene^, Linalool^, Citronellol^, Citral^.